What are the tools on the sidebar? The Brush tool is the default tool. This brush does not place on the board until you let go of the stroke. This is useful for layering your alpha and blend modes. There is a shortcut to cancel your line mid-stroke you can assign in the shortcuts manager. The smoothing brush works just like the normal Brush, but it also smooths and rounds your lines. You’ll mostly see smoothing drawing quick curved lines. There is a shortcut to cancel your line mid-stroke you can assign in the shortcuts manager. The Airbrush tool is similar to the brush tool, except its lines continuously place on the board after every movement you make. It is not a single stroke but many strokes. This is useful for rapidly placing low alpha or blend modes. 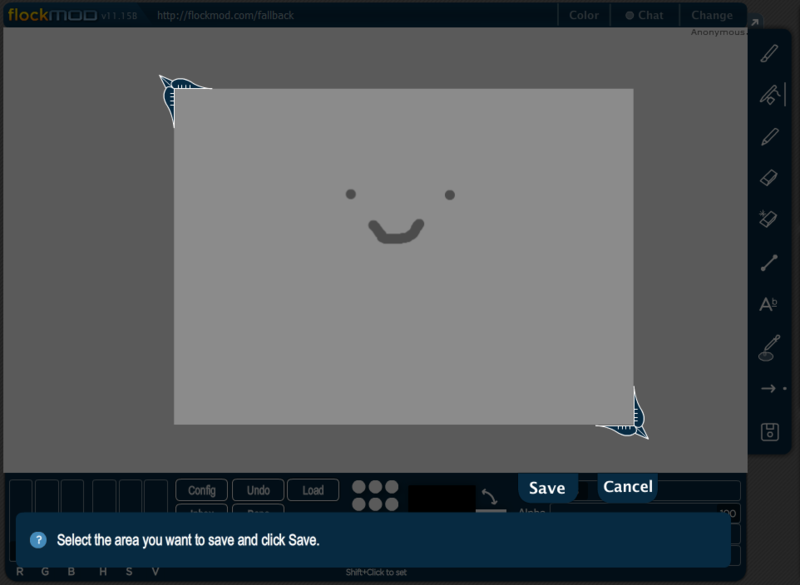 The Pencil tool is used for pixel drawing. It does not contain anti-aliasing and will only fill a single pixel. Similarly to the default brush, the pencil tool also does not place onto the board until you let go of your stroke. There is a shortcut to cancel your line mid-stroke you can assign in the shortcuts manager. The Eraser tool erases your markings. Similarly to the Airbrush it has rough edges which allow for pixel perfect erasing. If you’re in a layer mode room you will only erase on the layer you’re currently on. The Hard Eraser, which is only available in Layers, will allow you to erase from every layer at once. The Line tool allows you to draw a straight line. The Text tool is used to type text at wherever your cursor is located at. For overly long conversations, use chat instead of text. The eyedropper selects a color from the board and saves it as your active color. You may choose an option to switch back to your previous brush after you have picked the color in the configuration panel. The save icon is located on the bottom bar. By default this will save the current board into the Flockmod gallery. If you don’t want to save to the online gallery, you can uncheck the option in the configuration panel, and any saves will be saved on your computer instead. Also located in the configuration panel, you may toggle advanced save. Advanced save allows you to save a portion of the board rather than its entirety. The Auto-circle tool is usually used for blending colors. This tool will fill the circle with different values accordingly, depending on the surrounding colors. This tool is used to draw noise. The blur tool will soften and unfocus colors. The Rectangle tool will make a box. The Ellipse tool will make a circle/oval. This brush will load a selected custom brush for you to use on the board. Use the custom load to select the brush. Clicking this option will bring up the Brush Gallery. 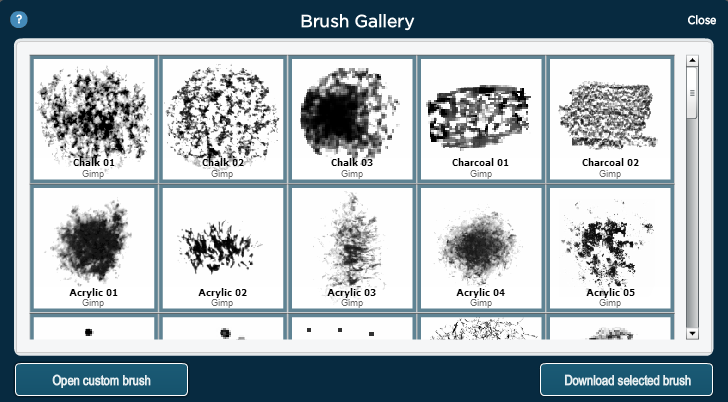 These are custom brushes you may use to draw with. You can use your own custom brushes as well, as long as they are in .GIH or .GBR format. These are also known as GIMP brushes (similar to Photoshop brushes, which can be converted to GIMP brushes). 2 mb size limit. Are there any hotkeys for these tools? Yes, the default ones are listed below. However you may change them to your liking in the shortcuts manager.